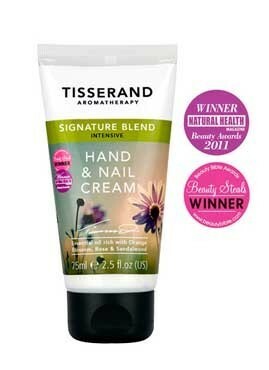 Tisserand Signature Blend Intensive Hand & Nail Cream provides care for hands and nails with its enriching formula of shea butter, kukui nut oil and organic chamomile. The cream also contains pure essential oils of sweet, refreshing geranium and fruity renewing bergamot to leave hands feeling intensely moisturised, without feeling greasy, while conditioning and rejuvenating nails. Tisserand’s essential-oil-rich products contain a unique blend of essential oils to create a sophisticated aroma, specially designed by aromatherapy pioneer Robert Tisserand. Massage a small amount into your hands and nails as often as you need. Aqua (Water), Cetearyl Alcohol, Glycerin, C12-15 Alkyl Benzoate, Caprylic/Capric Triglyceride, Cyclopentasiloxane, Glyceryl Stearate, PEG-100 Stearate, Polysorbate 60, Simmondsia Chinensis (Jojoba) Seed Oil, Phenoxyethanol, Sodium Benzoate, Lavandula Angustifolia (Lavender) Oil, Theobroma Cacao (Cocoa) Seed Butter, Pelargonium Graveolens (Geranium) Flower Oil, Aniba Rosaeodora (Rosewood) Wood Oil, Copaifera Officinalis (Balsam Copaiba), Santalum Album (Sandalwood) Oil, Butyrospermum Parkii (Shea Butter), Citrus Aurantium Bergamia (Bergamot) Fruit Oil, Aleurites Moluccana (Kukui) Seed Oil, Disodium EDTA, Xanthan Gum, Dimethiconol, Pogostemon Cablin (Patchouli) Oil, Daucus Carota Sativa (Carrot) Root Extract, Chamomilla Recutita (Matricaria) Flower Extract, Cananga Odorata (Ylang-Ylang) Flower Oil, Citrus Aurantium Amara (Orange Blossom) Oil, Rosa Damascena (Rose) Flower Oil, Anthemis Nobilis (Chamomile) Flower Oil, Mycrocarpus Frondosus (Cabreuva) Oil, Citric Acid, Geraniol, Limonene, Linalool, Benzyl Benzoate, Benzyl Cinnamate, Cinnamyl Alcohol, Citral, Citronellol, Farnesol.